I have a few rooms in my house with picture rails. Those upstairs are rather crudely done so I will replace them ...but the one in my pic is in the lounge. I am holding up an offcut I found in an old cupboard. It is covered in lead paint which I had started to strip (peel off). All in all, plastering will be much easier if I remove the picture rail and then replace with a new one of the same profile, which I will then paint. 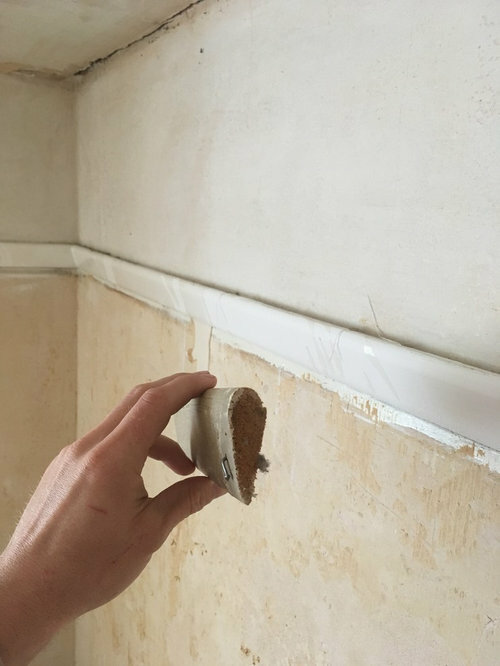 Is this somehow wrong if it is the original and therefore should I painstakingly peel the paint off, rub it back, plaster around it and repaint??? I'm worried I'm taking this 'original feature' thing too far. Chances are that this is original. I wouldn't worry about removing the picture rail. If you need to re-plaster and you keep it in situ you will lose some of the profile behind the plaster. 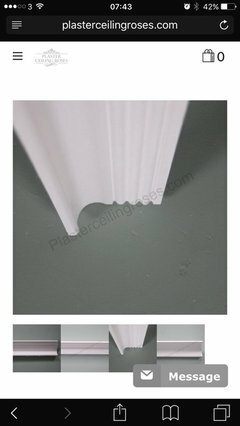 It will be very difficult to create a successful plaster job with it in place. Remove it carefully, strip it if you can be used be bothered (it is a lovely shape) and refit. Alternatively get a timber merchant to cnc copy the profile or a fibrous plaster company to mold copy the rail and produce in plaster. I say you should bin this with all of its layers of poisonous paint and replace it with new. I don't think it is necessary to have a faithful reproduction as it is not ornate. Personally I would consider if you ever replace it. The room will look taller without the picture rail. Is there nice coving? If not I would spend the money on that instead. Thanks to both of you. I will strip it out I think and get a similar moulding in timber and refit it as new. You've both helped me not to feel bad about it. Jonathan, I was thinking about a simple coving as a further addition. There was never coving there but since I've looked on here, some people have successfully used coving AS WELL as a picture rail. I'm happy with the ceiling not looking that high as I can lift it with white paint . Was trying to suggest that coving might be a better decorative option than a picture rail. There is lots of choice online. Something Art Deco might be in keeping but whatever you choose keep an eye on the proportions- the coving should come down the wall by a similar amount as the skirting height. I agree with Judith, I do a lots of work in 30's places. Don't worry about the lead paint its only dangerous if you burn it off or sand it off (in vast quantities), if the paint is well applied prep its as normal and just leave it alone. Definitely remove the pic rail before plastering (then reinstate). Cornice - naaaa certainly not deco, that's 20 years earlier, you need a big room for cornice. 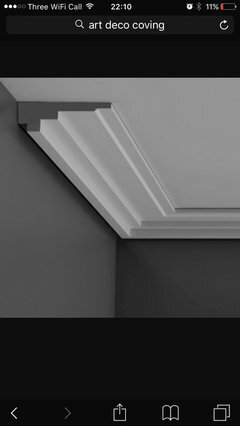 I have seen some 30's homes with a very very shallow cornice sometimes with a single step in it, about 120mm horizontal (room to wall) then only 6mm down, this simple step motif can then be repeated sometimes as a second step further back, its really nice, very subtle. Taking the original feature thing too far? you are talking to a man who who has brought his neighbours interior door handles and replaced theirs with brand new glass ones, it took me two days and a couple of hundred pounds but I'm very happy with my knackered old baker-lite handles. There are some good books on thirties homes, you have to remember that while UK thirties homes are influenced by Modernism, Deco and arts and crafts they were built between the wars when labour and materials were scarce, designs were much much simpler (often call "Utility"). So your profile is very, very simple. The house MAY have only had the pic rail in the "best" room when it was built. I bet your skirtings are about 90mm high with a simple bullnose as well. All these things tell a story that's whys it nice to keep them (in my humble). The profile is probably made of wild grown Scots larch as well, lovely wood, straight as a die with no knots. Other things you may see, Old lime plaster, with green premier paint, This is rabbit skin distemper, its use coincides with the identification and introduction of myxomatosis as a means of controlling rabbits! (Distemper stops lime plaster stains coming through the paint. Is it possible I am replacing my facebook obsession with comment boards on Houzz??? who knows??? I have black and chrome door handles but someone has painted them. I tried dipping one in caustic soda and I ruined it. What is the best way to remove the paint? A company called Rest Express make two amazing paint removing products, one is Caustic based the other is not. Have you tried ordinarily Nitromores? (Not sure what its made off so be careful! Cornice- naaa it certainly is ridiculous to suggest that you have to have a big room to take coving when it is found routinely in room like hallways which by design are smaller than most living rooms. Whilst I agree that the Deco period was before this house was built I suggested this style because firstly my grandparents had it in their small 1930's semi, it is less ornate than Victorian and Georgian coving which is abundantly available and because the profile came down the wall by a small amount that I am sure will echo the proportions of your skirting. I have included an image of the type of coving suggested by Steve which would also look great- similar images can be found with an image search for Art Deco coving. Ultimately anything you put into your house now is a personal preference and you don't have to be faithful to the original period - if that were the case I would currently be stoking a coke fire rather than controlling my gas central heating with an app on my iPhone. What lovely coving. Really caught me by surprise as I am not a fan. Shallow and not too imposing, I would have that in my room. Jon- sorry I mistakenly called you Steve- thanks for the offer to see your coke fire- I might take you up on it sometime. That picture rail matches what I have in my 1927 house and mine is the original. I really like its simplicity and will be keeping mine and reinstating it in the dining room (the one room in the house that the previous owner stripped of its originality). The original fireplace went, too. I'm on the hunt to replace that. My picture rails are all very slightly wonky but I get pleasure out of knowing its been here all the time. Good idea! I'm hoping to add to mine - on walls which I've moved back and where there are now gaps and in the room from which it was removed. I like it as it is so simple but it adds character and authenticity. I hope I find someone who can copy it, too. I will let you know what they charge. This company is based between the villages of Stockton and Long Itchington near Rugby in Warwickshire. I think it is called 'Timber Mouldings' but I was just going to pop in. That would be great, thank you. If they do it it must be that others do it, too, so I'll start a hunt when I know the rough cost. Good luck! That's very useful advice, thank you. Just to update you. The company in my village that do timber mouldings have quoted me £1.70/m to produce this moulding in the picture!! It's brilliant. What a result, Steve West! Good to know. What would our 1930s terrace interiors have looked like? Is our picture rail original 1930s or a strange 1970s addition? Who else has kept their 1930's original glass panels and front door?